On this page you'll find all the information regarding the projections for the 2017 BC provincial election. Throughout the campaign, this page will be updated with the latest polls and other information. If you want to make your own projections (because, for instance, you don't believe the polls), you can use the simulator here (as well as a regional one here). Note. the final projections have been posted, you should read the blog post instead of this page (or on top of it). Based on all the data available so far. This includes the polls, as well as the number of candidates, long term incumbents not returning, etc. The probabilities are obtained running thousands of simulations where we randomize multiple times. Specifically, we account for the uncertainty of the pols (i.e: the margins of error) as well as the distribution of the vote (also known as vote efficiency). Our probabilities have proven to be accurate even when the polls were not. This is, according to us, the most important thing we are providing on this site, even though most people will usually focus on the average numbers. Note: The projections are based on the most recent poll average. However, this site uses an adjusted average. Adjustments are made to account for the typical underestimation of the incumbent government (almost every recent election in this country has had this phenomenon, including the 2015 federal one), as well as the typical overestimation of the smaller parties. Specifically, we allocated undecided differently. Typically, polls redistribute undecided (or the "don't know") proportionally. We believe this is a mistake. First of all, smaller parties should not get any undecided voters and we believe this is the main reason behind the typical overestimation of these parties by the polls. Secondly, instead of allocating the undecided purely proportionally between the main parties (in BC we are talking of the BC Liberals, BC NDP and BC Green), we allocate 50% to the incumbent and the rest is proportionally allocated to the other two. 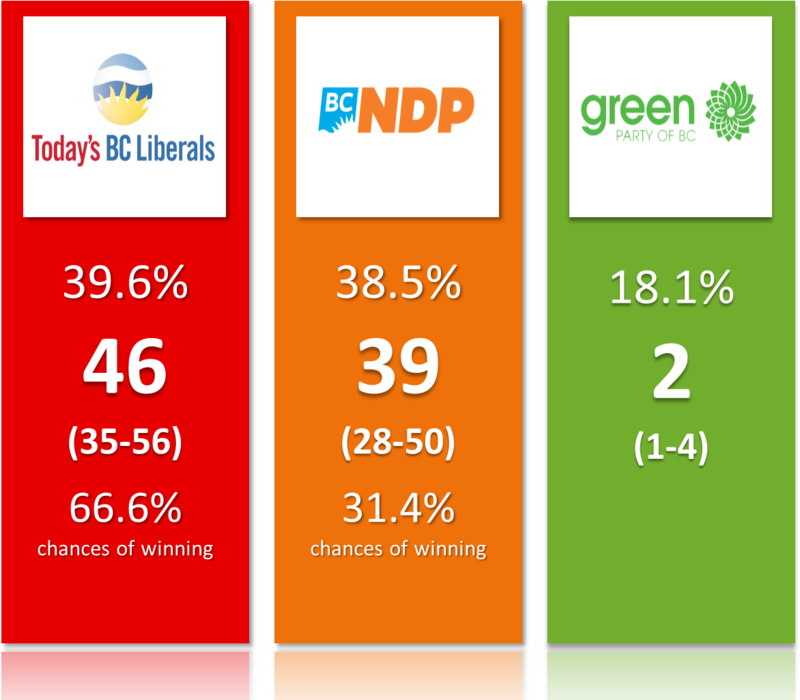 If you want to know how much of a difference it makes, if the Liberals and NDP are at 40% and the Green at 20%, it means the BC Liberals would only get 40% of the undecided using the proportional method while we allocate 50% in our adjustment average. This is indeed an arbitrary choice but it has proven to work well in the past. We will modify this allocation if we see new data or if we have any reason to believe it is incorrect. Allocating undecided is always tricky. The last federal election saw both the Liberals and Conservatives getting a bigger share of them. As usual, if you think we are making a mistake, just use the simulator. 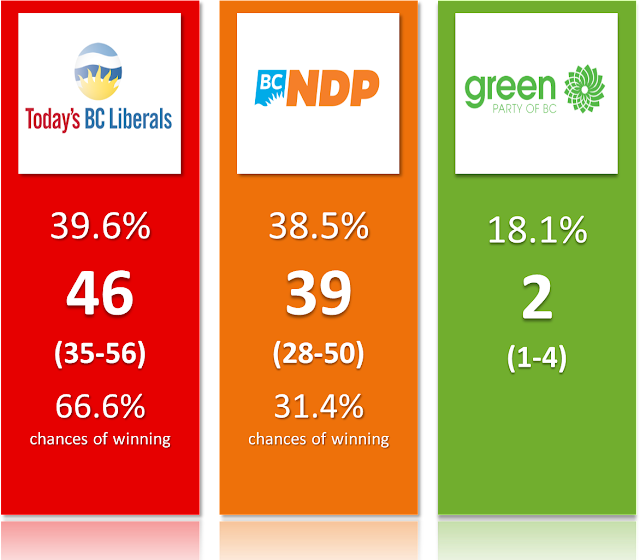 Here below you have the polls published during (or just before) the 2017 BC election. You even have the information by region. These graph show the voting intentions as indicated by the polls. There is no adjustment or anything done.